A state-run Korean Catholic Association also exists but, similarly, has no ties with the Vatican. According to news wire AFP, KCA estimates there are 3,000 Catholics in the country, while the UN puts the number at around 800. So why on Earth would the pope go there and why would Kim Jong-un invite him? ABC News had some more details. Kim told South Korean President Moon Jae-in at a summit last month that he would "ardently welcome the pope if he visits Pyongyang," according to South Korean officials who were quoted widely in media Tuesday. The news of Moon's interest in a visit from the pope comes as Moon is about to begin a European trip that will include a private conference with Pope Francis at the Vatican where the South Korean president is expected to pass on Kim's invitation in person. Moon, a practicing Catholic, will meet with the pope on Oct. 18, Vatican spokesperson Greg Burke said. The New York Times predicted the visit would probably not happen. There was no immediate comment from the Vatican on whether Francis would accept the invitation, but it is considered highly unlikely. Mr. Moon hopes that Francis might accept Mr. Kim’s invitation in a landmark moment for easing tensions on the peninsula. A visit would also signal a willingness by Mr. Kim to open his country. But should the pope accept the offer, he would wade into a country widely accused of torturing and even executing the faithful. As for the “why” of the invitation, far less was available. Was this just a PR stunt? First Donald Trump; now the pope? The Vatican News only said Francis is interested in the country. Although it is unclear when Catholicism first came to Korea, the religion made meaningful inroads into Korea in the 18th century. There are accounts of Catholic baptisms and furtive gatherings among Catholic Koreans in the 1780s. But all forms of Christianity were persecuted until the late 19th century. The northern half of the peninsula had been home to thousands of Christians, including Catholics, before Mr. Kim’s grandfather, Kim Il Sung, came to power as North Korean state founder. Pyongyang had once been known as the “Jerusalem of the East” for its preponderance of Christians, and Kim Il Sung built three showcase churches in the city, but critics say that was to hide his country’s religious intolerance. 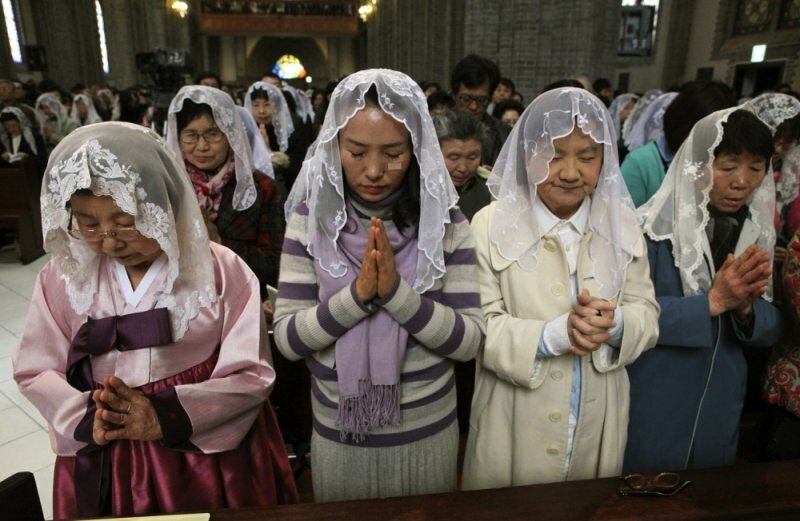 Since the end of the Korean War in 1953, North Korea has banned Catholic priests from residing there. The Vatican doesn’t keep statistics for Catholics there. This year, my GetReligion colleague Ira Rifkin wrote about North Korea here and I covered it here. I can’t say either of us foresaw a papal drive-by. Will he go? What would be his conditions if he did? There’s so many rich possibilities to be mined here, yet when I checked with various Catholic news outlets, I found nothing that told me what was up. Even ForeignPolicy.com had nothing. Neither did the South China Morning Post. Odd. Must say Pope Francis must find the offer quite tempting. It used to be said that popes wanted to be invited to visit China, where there’s definitely a Catholic presence. And now North Korea wants to upstage its next door neighbor? Clearly something’s going on in east Asia and if this possibility has been in the works for some time, journalists covering the region should be knowledgeable about it. Judging from what’s out there in today’s news, few of them were. I’m hoping the next few news cycles will have more information. After all, Kim Jong-un isn’t putting his name out there for nothing. He’s laying his cards out on the table because he’s guessing the Vatican will bite. And if it it does, that will be the papal press trip of the century, don’t you think?